If you think that your cloche is only for fall and winter gardening, you’re missing out. It is great for your summer crops too. A cloche is versatile. You can set it up over your heat-loving crops and get them growing more robustly. Sure, tomatoes will survive in our weather, but they are at heart tropical plants. If you create greenhouse conditions, you will help them thrive. Putting a cloche over your tomatoes can give them an extra warm start. Be careful right after you plant them. Transplanting can cause shock. If the plant goes from the equivalent of a spring camping weekend at Mt. Rainier to a Mexican resort – well, wouldn’t we all be a bit befuddled? I’m quite certain that I could quickly adjust; not so sure about the plant. Pay more attention to watering. At the Ohanapecosh campground, you and your belongings will have plenty of chances to get wet, while it’s much less likely to rain on your Cabo Wabo parade. Plus, you’re sitting under a beach umbrella down there. But how do you escape the rain when in the shadow of The Mountain? Retreat to the tent! Or pull out the ubiquitous blue tarp. Perhaps I’ve taken the metaphor a bit far (ya think?) but the point is this: your plant will dry out much faster under the cloche, where it’s always Mexico. You need to play cabana boy and regularly bring it a cool drink. 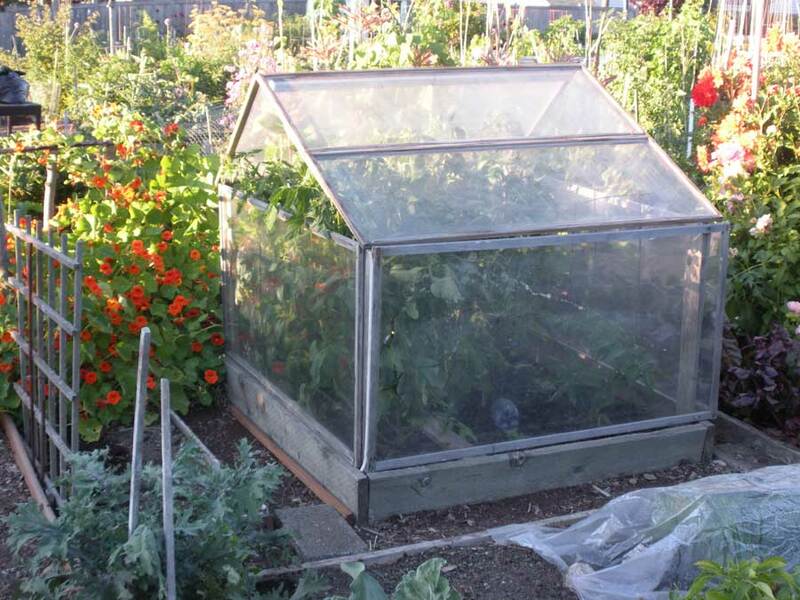 A friend erects this open cold frame over his tomatoes each summer, leaving it on nearly until harvest. Perhaps, like me, you use the Wall o’Water to protect your tomatoes. I swear by them. So the cloche can be used for other plants that need the heat. If you’re crazy enough to try melons, you will definitely need the cloche. But all those other heat-loving plants can benefit from a warmer start that the cloche provides. For squashes, pumpkins, melons and basil, you will get a much faster and more assured germination of the seeds. For transplants, you will again be giving them the conditions they are genetically predisposed to expect. You won’t be leaving the cloche on all summer; just until, oh, let’s say Bastille Day. We should be good and sick of our long, lingering spring by then – off with its head! Between now and then, as you pay attention to the needs of your hot crops, also plan ahead for the day that the cloche will be removed. If spring showers are predicted for a warm day, pull back the cloche cover and let the rain shine in. It’s best to do this if it’s predicted to rain in the morning and then get nice, because you’ll want the plants to have enough time for their leaves to dry before covering again. This is especially important for tomatoes and squashes. Water standing on the tomato’s leaves and stems will promote late blight. Water on the squash leaves can promote powdery mildew. So, for the same reason that you don’t use overhead watering on these plants, don’t expose them to too much rain. And if it does rain on them, hopefully there’s also a breeze that will dry the leaves or enough time for evaporation before you re-cloche them. Looks like the owner of this community garden plot went on a long vacation, and the tomatoes are bursting out. Such a crowded situation can trigger diseases. Just like ending a vacation by allowing thoughts of your commitments to seep back in, you want to wean your plants off their Mexico environment when it’s time for them to return to the Pacific Northwest. Pulling off the cloche one day like a magician unveiling a trick could again cause a shock to the plants. Best to ease the plant into its natural conditions. How? Short-term exposure. On warm days, pull the cloche plastic off for a couple of hours. On a really warm day, let it off for the afternoon. But be sure to reinstall it as the sun wanes, and leave it on overnight and in the morning. Open the ends. Once the nights are predictably warmer, roll up the ends of the plastic and clip them onto the cloche hoops. This will keep the plants dry, but allow the wind to blow through and strengthen the plant stems. It will also moderate the warmth, helping the plants to adjust to the fateful day when you will remove the cloche completely. This cloche with open ends allows air flow on warm days, so the plants don’t overheat and wilt, and the soil dries out a bit. Inconsistent weather is a hallmark of a Maritime spring, and using a cloche can help our plants have a little vacation in Mexico, without ever leaving the yard. Bonus tip: use the cloche for shade. Once you’ve pulled the cloche off the warm-season crops, move it over to your summer plantings of lettuce and other greens. Cover it with floating row cover (Reemay, etc.) to shade the tender lettuces during our warmest time. 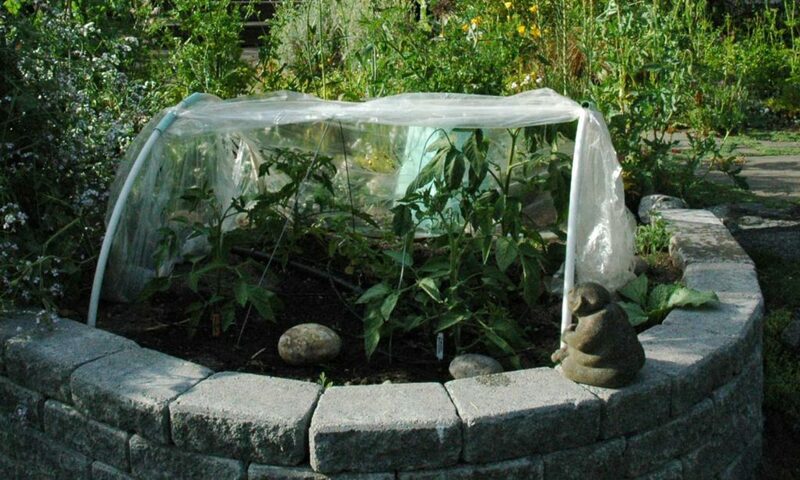 You can also use it this way to keep insect pests off of your plants – especially helpful when they’re young seedlings. 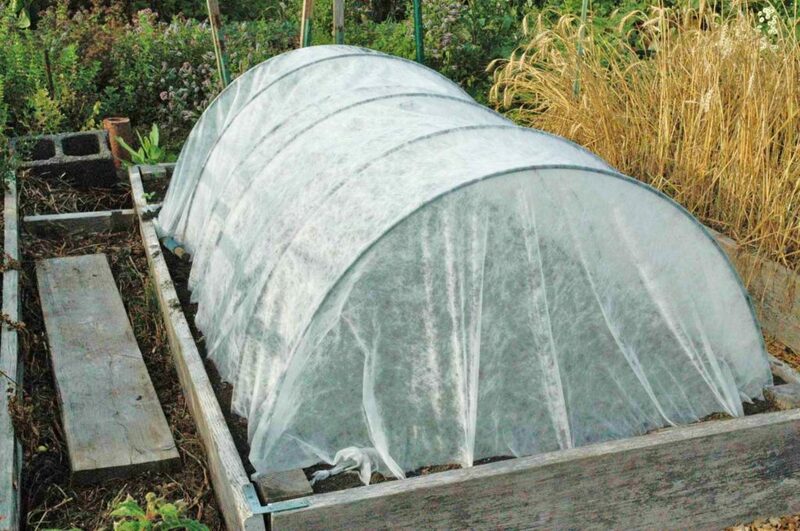 A cloche draped with floating row cover instead of plastic can protect summer plants from bad bugs.